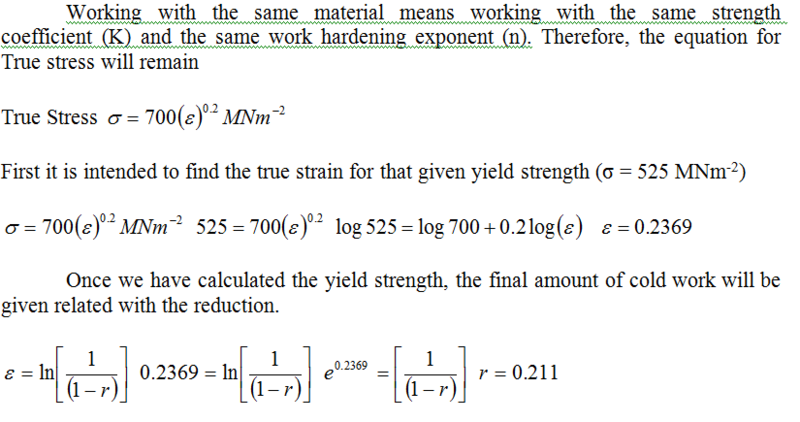 (a) The work-hardening behaviour of an annealed low-carbon steel conforms to: σ = 700 (ε)0.2 MNm-2 where σ is the true stress and ε is the true strain. 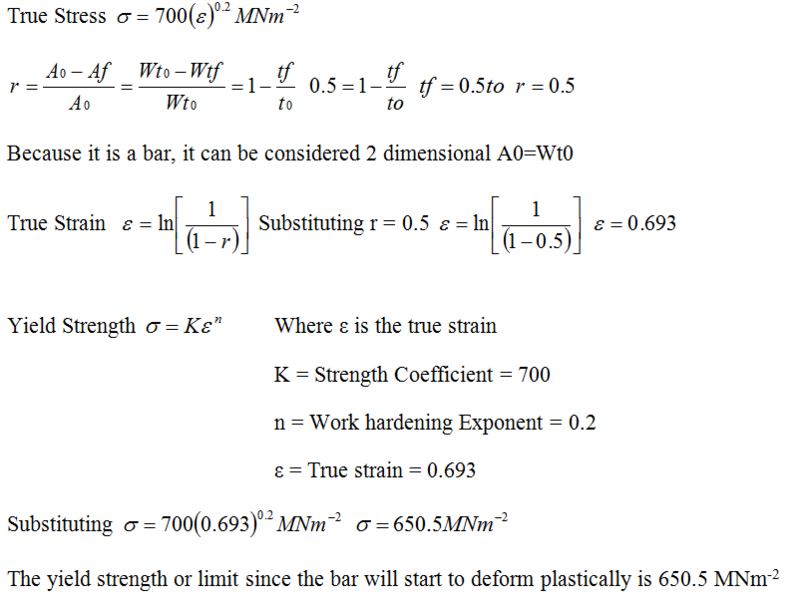 (b) Suppose another bar of the same material was cold-worked by an unknown amount and then cold worked 15% more and found to have a yield strength of 525 MNm-2. What was the unknown amount of cold work? (c) It is proposed to manufacture a metal part by press-forming a. 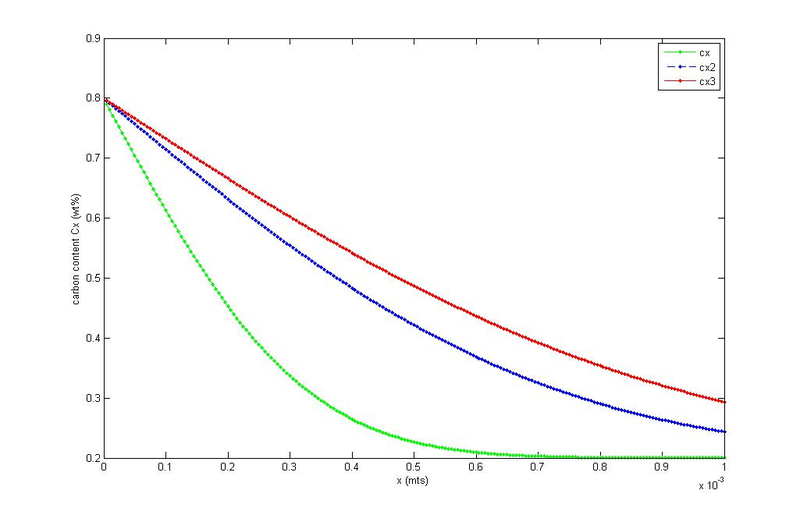 The critical region of a proposed pressing has a major engineering strain of 0.38 and minor engineering strain of 0.03. The pressing is found to split under the operating conditions used. The material used was lowcarbon sheet steel, which has a forming limit diagram as shown below. Explain why the pressing failed and discuss possible methods by which the part could be made by press forming. 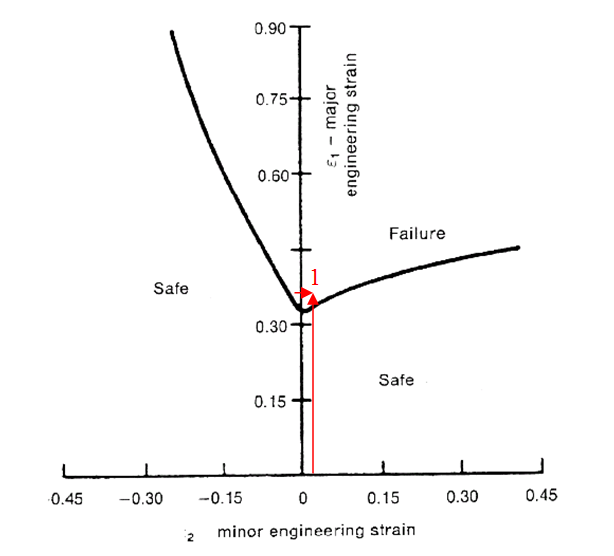 The pressing failed because for that combination of major and minor engineering strain stresses, the point lays in the failure zone. See point 1 It is evident looking at the FLD that the presence of a tensile minor engineering strain reduces drastically the available strain before breaking. 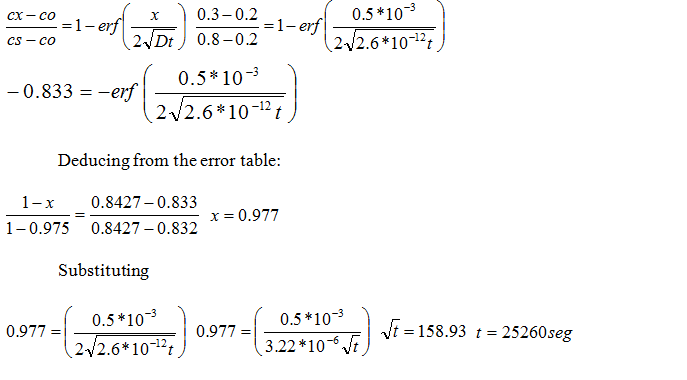 (i) Calculate the plane strain fracture toughness KIc of the glass. (ii) If the glass sample is subjected to a stress of 30 MNm-2, failure is found to occur after 15 days under stress. Assuming that the surface energy of the glass does not change, calculate the average rate at which the crack has grown over this period of 15 days. (b) Discuss methods by which the fracture toughness of ceramics and glasses can be increased. Include in your answer the relevant principles of materials science and two detailed examples (one from a ceramic and one from a glass) in which the fracture toughness has been successfully improved. Ceramics itself have a very large lattice resistance, given by the abundance of covalent bonds. Dislocations (causes of cracks) need high stress to move through the covalent bonds structure. This results in a high integrity to corrosion and reduced ductility or plastic deformation, but also brittleness (not adequate for impact stress). Added to this, it is very difficult to get rid of cracks and flaws originated in the production process (pores, thermal stress originated during the cooling phase). 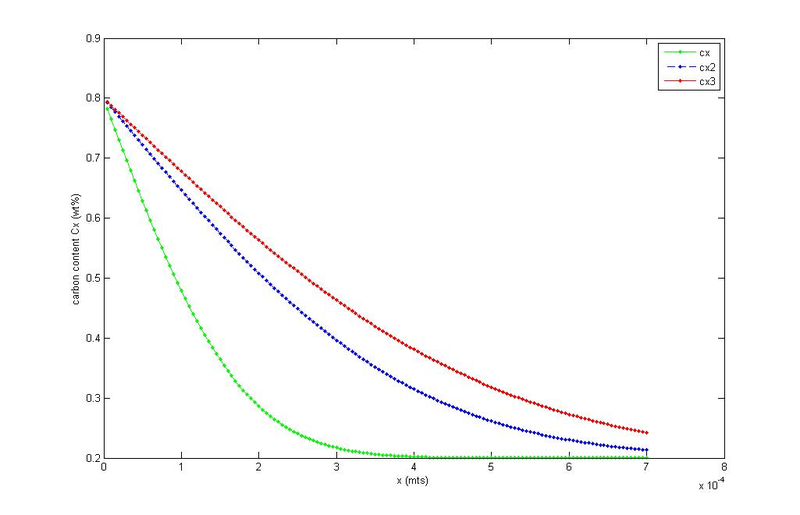 Where K1c is the toughness of the material and ‘a’ is the flaw size.It seems evident that the two ways to increase the toughness could be or increase K1c (difficult because it is a property of the material) or reduce the flaw size a. New developments in technology of materials lead some researchers to experiment with the conductivity of materials. Ceramics, usually known as non-conductive were going to be tested for new conductive aplications. The researchers included carbon nanotubes, known for their conductivity and high strength into pure alumina ceramics. The composites were prepared under pressing furnaces with fine powder alumina. When an electric field was applied, the nanotubes got oriented in parallel with this field creating a matrix inside the composite. The conductivity test was successful, but what was more interesting was the increased toughness of the ceramics. Nanotubes absorbed a percentage of the fracture energy by creating bridges between the alumina grains. Usually are these boundaries the weakest links where cracks propagate. As it is mention by Zhu, Y. et al (2007) only the nanotubes perpendicular to the fracture direction were effective, but orientation of nanotubes can be feasible when applying an electric field. Similarly, glasses have been toughened with reinforcement matrix. The characteristics of the materials chosen for these matrixes are high strength or high ductility. It has been widely tested the application of silicon carbide matrixes for transferring the load from the crystalline structure to the fibres. These methods intend to increase the Young’s module of the composite (‘Y’ as has been discussed before) See Brennan, J.J. (1982). Other experiments intend to introduce in the crystal structure foreign particles pretending to trap and deflect the energy of the crack. These inserts lead to the creation of strong bonds with the glass. A good example of this practice is the doping with alumina platelets from Kotoul, M et al (2007). The platelets were hexagonal shaped, and added while manufacturing. They resulted into “tangential compressive and radial tensile stresses in the matrix” that improved the toughness of the material. (a) Discuss what types of defect in a casting can cause catastrophic failure of cast components that are subjected to load-bearing applications. What precautions can be taken to prevent the formation of porosity in the casting and avoid cavities due to shrinkage during solidification? Casting consists basically in pouring a molten metal into a mould with a desired shape. When the metal cools down, it solidifies. Despite the numerous methods for casting process (sand moulds, permanent moulds, pressurized casting, etc) porosity and inclusions are normally present. To avoid porosity, different cures can be adopted. The metal can be degassed (remove dissolved gasses) while in the liquid phase by adding reactive chemicals or casting in vacuum or pressure tight. In load bearing applications, it is as important the surface integrity of the component as the interior of the piece. It is worthy to take a look on how the grains grow from the outside to inside. As columnar grains grow, at the same time they push impurities ahead of them. In many cases this ‘segregation’ brings different concentration of impurities along the component, different composition and different properties (yield strength). 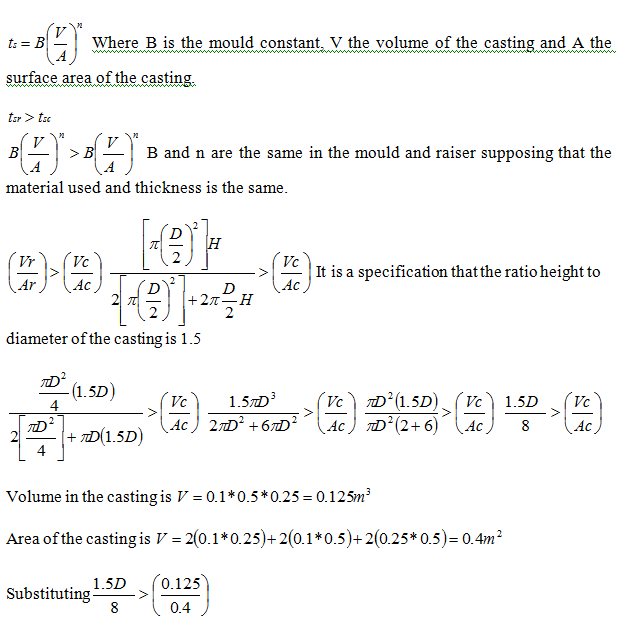 (b) Calculate the volume, diameter, and height of the cylindrical riser required to prevent shrinkage in a 100 × 250 × 500 mm casting during solidification if the ratio of height to diameter (H/D) of the riser is 1.5. The function of a riser is to maintain the supply of molten metal to the cast while solidification, to prevent shrinkage and cavities in the mould. It is important for this that the solidification occurs first in the mould and then in the feeder. In other words Solidification time in the riser must be greater than solidification time in the cast. Solidification time is given by Chvorinov’s rule, which stands for proportionality to the volume to area ratio of the casting. 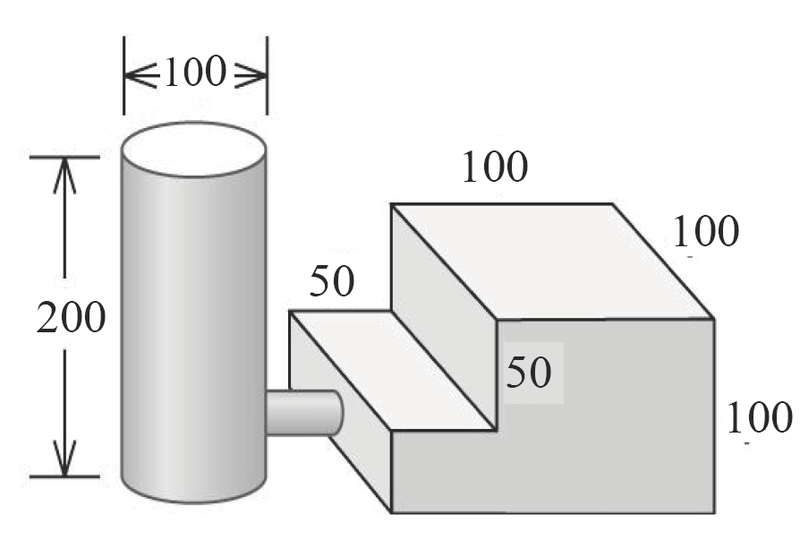 (c) Figure Q3 shows a cylindrical riser connected to a casting for the purpose of controlling shrinkage of the cast during solidification. 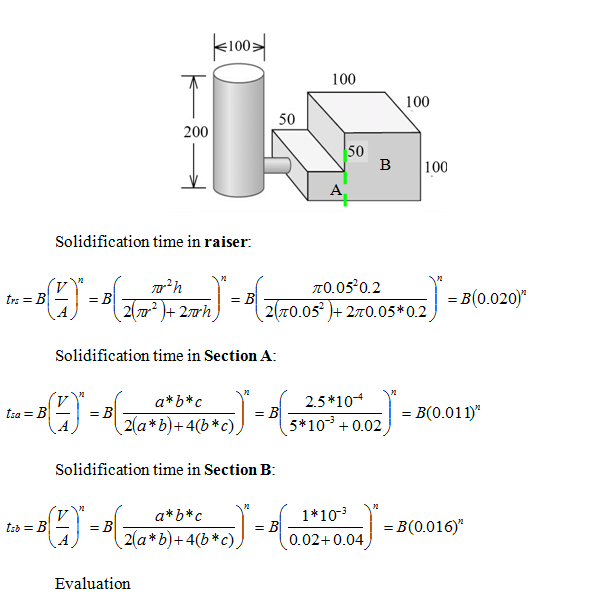 Compare the solidification times for each casting section and the riser, and comment whether or not the riser will be effective and why. 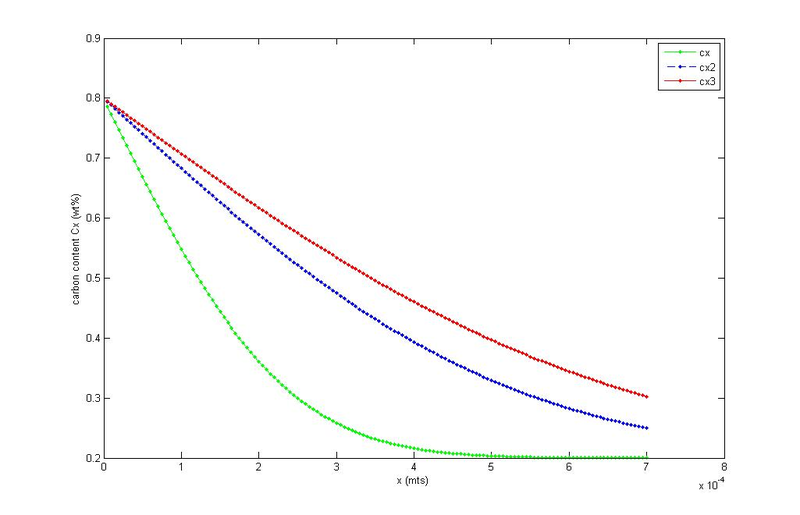 (The dimensions in Figure 3Q are in mm). Explain why the carburizing process is expected to cause an increase in the hardness of the surface of plain carbon steels. The surface of a 0.2 wt% carbon steel component is to be hardened by gas carburizing, in which the steel component is placed in an atmosphere providing 0.8 wt% carbon at the steel surface. Table 1 gives eight carburizing conditions, assume that the surface carbon content is maintained at 0.8wt% in all these conditions and that the diffusion of carbon in steel conforms to a semi-infinite system. A carburizing process intends to spread a concentration of carbon through the section (profile) of a piece. This is done mainly exposing the surface to an atmosphere rich in carbon atoms. The carbon atoms are diffused into the material atomic structure, impeding the atomic planes from shearing (anti deformation) and compressing the surface (anti cracking). Carbon atoms are usually smaller than the atoms of the material, this is the reason why they can fit between the atomic structures of the surface and compress it. It is also worthy to mention that the alloys used for carburizing are still not saturated of carbon, so more atoms can be diffused. Carburizing aims to improve the properties of the surface, not the interior of the piece. Edwards, L (1990) outlines the physical properties given by the martensite created by the high carbon content, “this volume increase creates a compressive residual stress” between the atoms, providing increased hardness. (ii) The steel components requires a 0.3wt% carbon content at a depth of 0.5mm below the surface. Decide on the carburizing conditions (temperature and time combinations) that will meet the requirement. Illustrate your answers with a graph. With a temperature of 840ºC there will be necessary 25260 seg. (7 hours) during a carburizing period of eight hours. 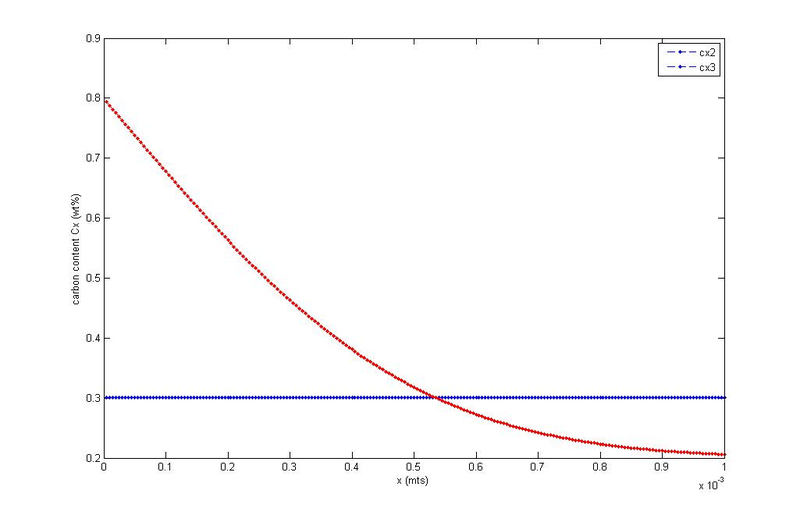 Plot 4: For T=840ºC and diffusion along 8 hours. Ashby, M.F. (1998) Engineering Materials. 2nd Edition. Butterworth Heinemann, Guildford, Great Britain. Kalpakjan, S and Schmidt, S. (2006) Manufacturing engineering and technology. 5th Edition. Prentice Hall, Singapore. Edwards, L. (1990) Manufacturing with materials. Pp 90 and Pp 49. Butterworth Heinemann, Ltd. Milton Keynes, Great Britain. Zhu, Y. et al (2007) Preparation and properties of alumina composites modified by electric field-induced alignment of carbon nanotubes in Applied Physics A 89, Pp 761-767. Springer-Verlag 2007. DOI: 10.1007/s00339-007-4165-8. Published online.